Again, my Scraphappy project this month comes out of looking for ideas for my sewing sessions on a Wednesday afternoon with my friend, Sandra. 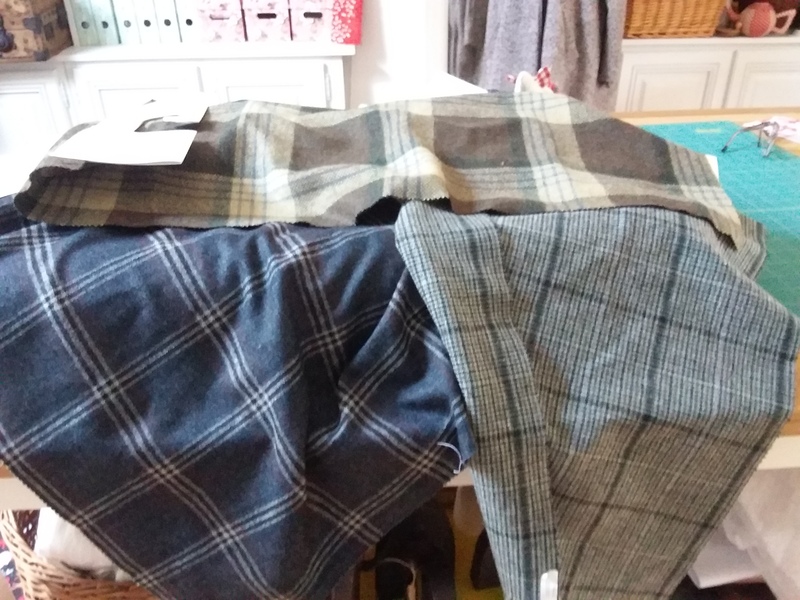 Having finished our coats (well, I have) I wanted something a bit less ‘major’ to do round at her house – lugging coat fabric, lining, my machine and all the other coat making paraphernalia round to her’s was a bit of a nightmare – so I bought a pattern I’d had my eye on for some time. Patchwork Pottery’s teacup (or coffee/hot chocolate mugs) pattern. 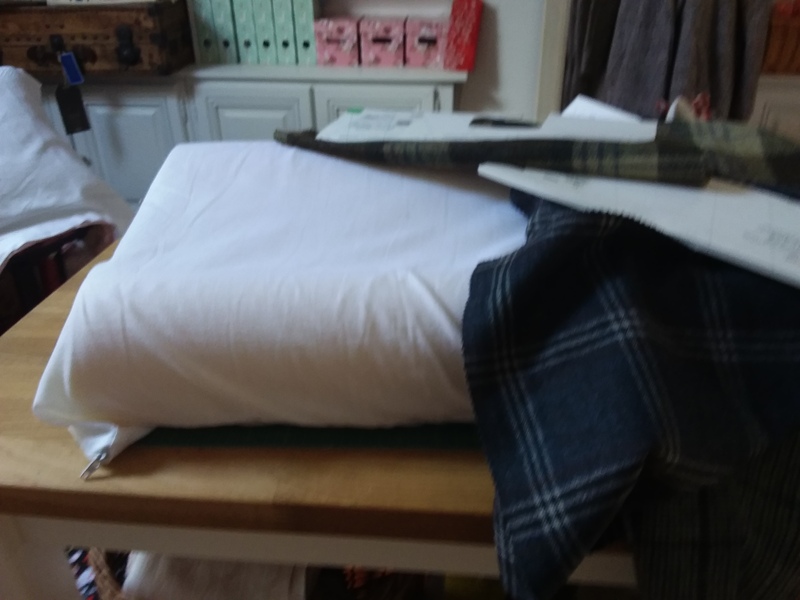 When I’ve made make up and wash bags in the past I’ve generally used some linen/canvas type fabric for the outer and kept all the scraps as it tends to be a bit more expensive than cottons. 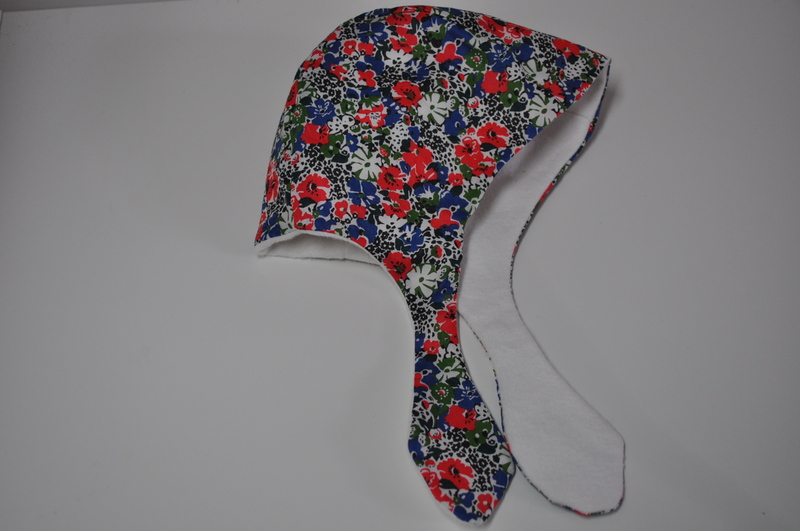 I thought they’d be perfect for this pattern not least because one of the fabrics actually has cups on it. Of course, the teacup is my favourite. But I made a coffee mug too. The teacup is just the right size for bits and pieces for sewing – or even to keep tea bags in when travelling. A pair of reading glasses even fits inside. The coffee cup is large enough for a pair of sunglasses or even a crochet hook and some yarn for a small project. Apart from wool, fabric is my scrap of choice (in other words I have loads of it) but I know Kate welcomes all scrap projects. She reminded me recently, when blogging about her kitchen renovations and having shelves made from the same wood as her worktops, that Mr. Tialys had made a knife rack out of an offcut of our wooden worktops and a magnetic strip so, for the sake of variety, here it is. 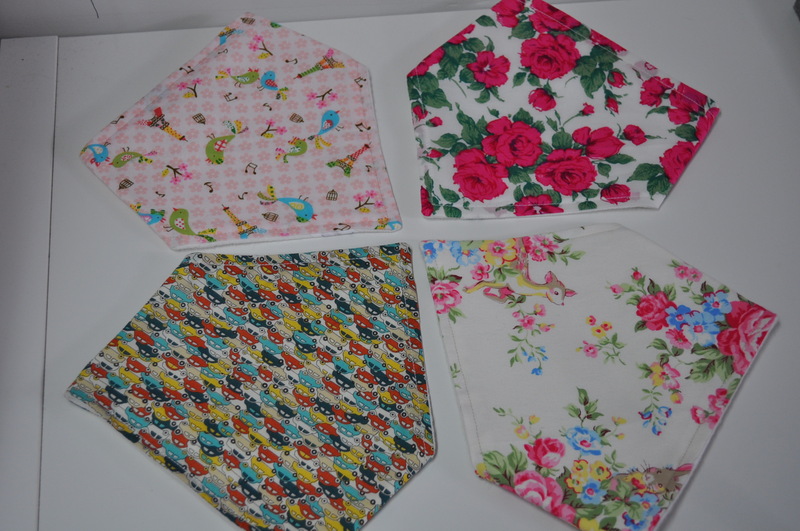 If you want to turn scraps into something useful – doesn’t have to be fabric and doesn’t have to be every month – pop over to Kate’s blog and let her know. Have a look at what everybody else has been getting up to this month. – here’s a list of people who often participate if you want some inspiration. On Tuesday morning, I just logged on quickly to check my emails and the news headlines while I had my breakfast. Oh Look! 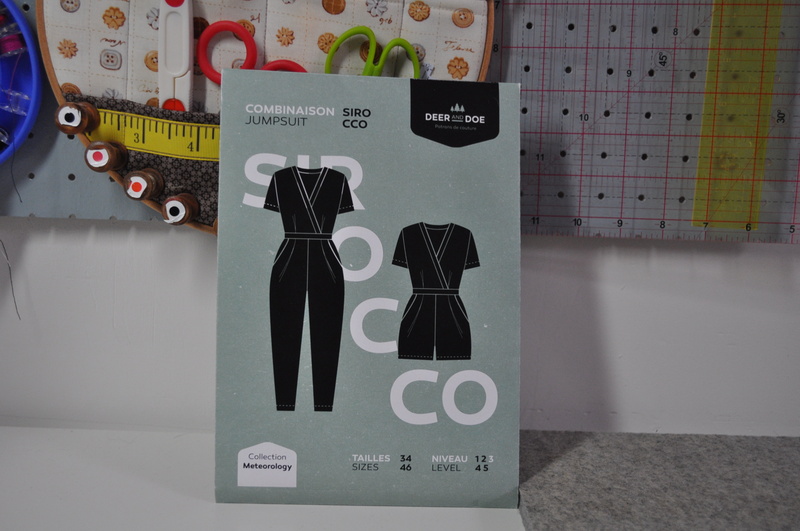 Deer and Doe have a new dressmaking pattern out today. I like Deer and Doe. Come on, you’ve got loads of patterns, you still haven’t done anything with, surely you don’t need any more. Yes, but look, there’s an introductory offer of 20 % off and delivery is free. Plus, it’s a jumpsuit. You know, an all-in-one thingy – a boiler suit. Get a grip woman, you haven’t worn one of those since the 80s. Yes, but that was a bit utilitarian looking, sort of communist chic. This one looks all nice and drapey and it’s in jersey. Yes, but where will you wear it? Well, I don’t know but I bet Mlle Tialys the Elder would like this pattern too so she could share it which makes it good value. Then I could make the shorts version for Mlle Tialys the Younger to wear this Summer. I thought you’d decided to make a blouse next. Well, yes, but I’ve discovered I prefer making things that are a bit of a challenge these days and I’ve never made a jumpsuit before. 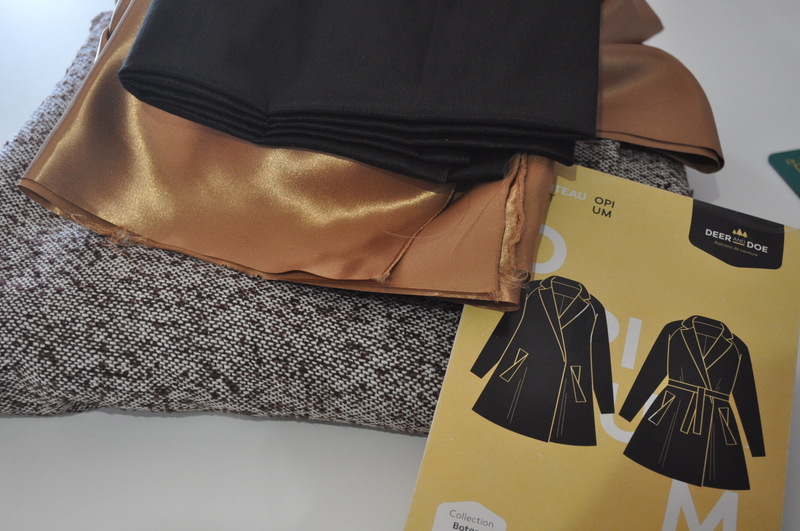 But I’ve got the perfect jersey fabric in my stash and my overlocker is already threaded up with the right colour thread – it’s a sign. That’s it, I’ve pressed the button, I’ve ordered it. But how will you go for a wee? Nooooooo! I remember now! Why didn’t you stop me? 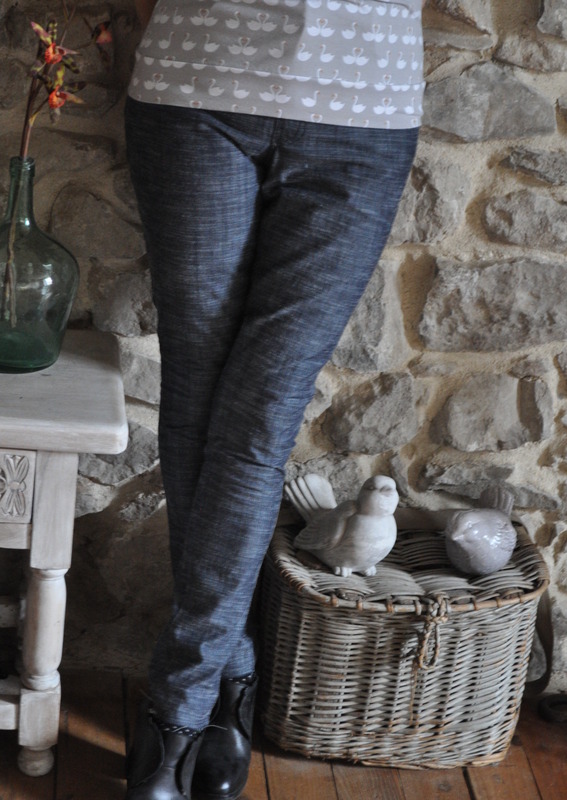 This weekend I’m hoping to finish my jeans and I’m hoping even more that, this time, they’re going to fit me. 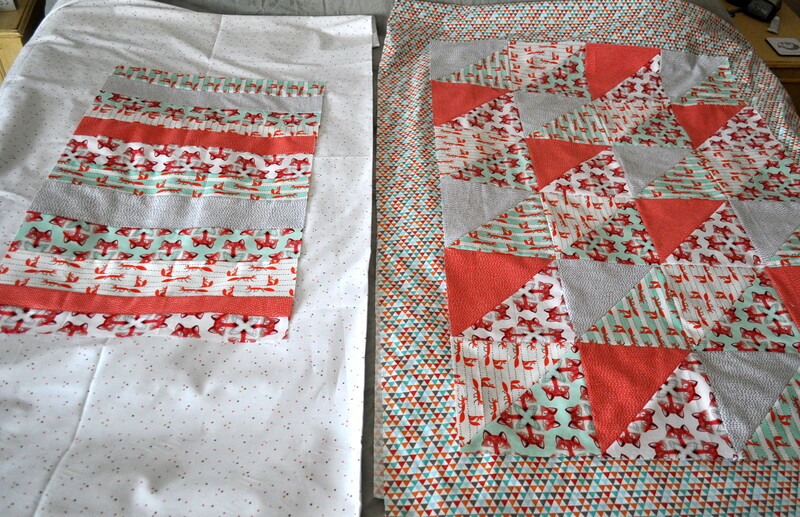 Despite making a stupid error along the way – which involved cutting excess fabric off that wasn’t actually excess! – I think I might have cracked it. 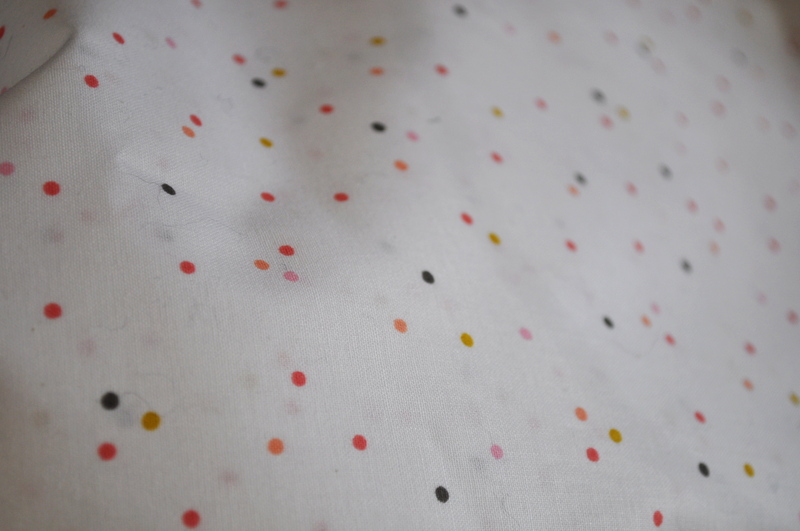 Here are the pocket linings I chose for fun even though nobody (or very few) people will ever see them but me. I’m doing the top stitching using Gutermann’s top stitching thread in a silvery grey colour to go with the floral pattern. 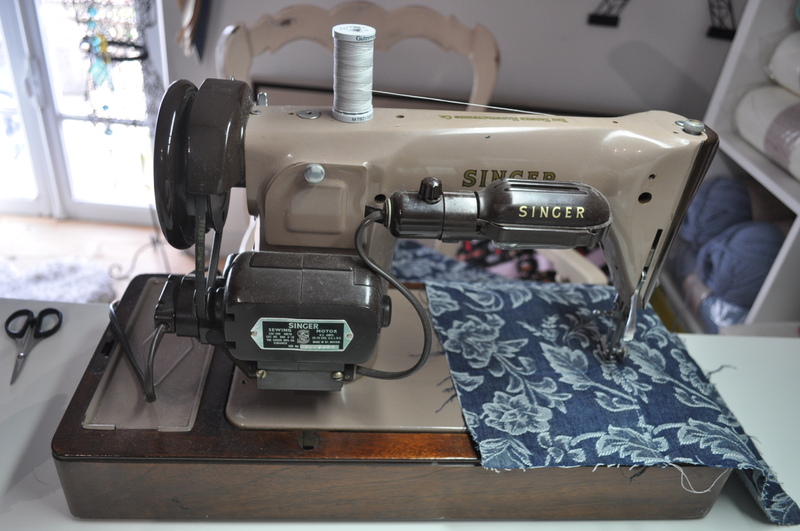 I’m using the 1950s electric SInger my friend gave me which used to belong to her mother because life is much easier if you have one machine threaded up with the top stitching thread and another with the thread you’re using for basting and seaming and even easier if you also have an overlocker/serger for seaming or finishing or both. So you end up with a set up a bit like this. Sorry about using Babe for a pincushion but it was that or the charity shop. 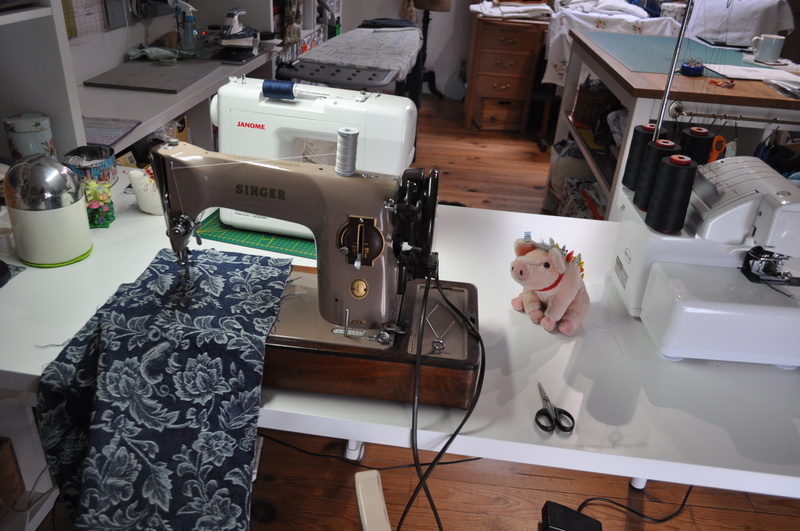 Anyway, Bekki over at Dartmoor Yarns had asked to see my vintage machine top stitching in action so there you go. There’s even a back view. The machine is struggling a bit with the lumps and bumps of the various thicknesses but I think it probably just needs a new needle which I will sort out before I tackle the stitching on the waistband and pockets. 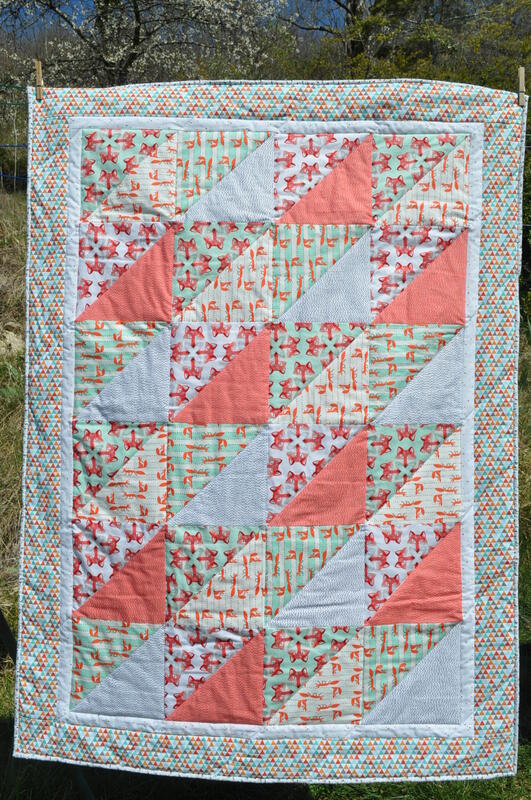 As you know, I’m not sending the Foxy Quilt I made for my niece’s June baby until I can make a label for it with date of birth, etc. so, in the interim, I had a rummage through my previous hand made efforts and made up a little parcel to start her off although, knowing her, she’s already got cupboards and wardrobes full of designer stuff. I am reliably informed however – well, as reliable as my sister gets – that her daughter (my niece) loves hand made items so she will be inundated with my doomed plans to possibly add baby stuff to my Etsy shop. Doomed because I am not dedicated enough to make the same thing twice so, even though I made some pretty baby dresses in Liberty tana lawn and Tilda fabric, I only ever made them in one size and, when asked by potential customers to make one up in a different size, I couldn’t be bothered quite get up the enthusiasm. 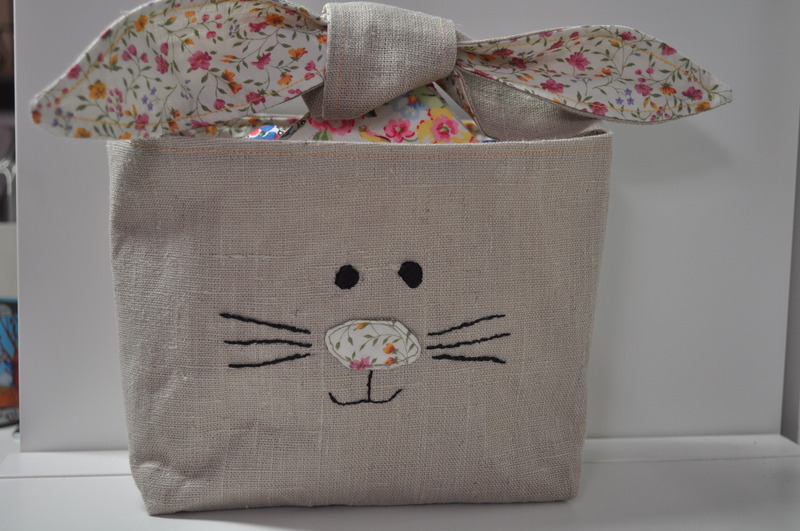 So, this time round she’ll get this bunny basket …..
and four little bandana baby bibs. So, let’s hope my sister’s right. Have you got a big project on this weekend? I hear the weather’s not going to be up to much either here or in the U.K. so it’s the perfect excuse to stay cocooned and get creative. ** Just in case it was worrying you , ‘Blue Jean Baby’ are the first words of ‘Tiny Dancer’ by Elton John. Now, if you cared at all, you don’t have to look it up. Guess what I’m having another stab at. 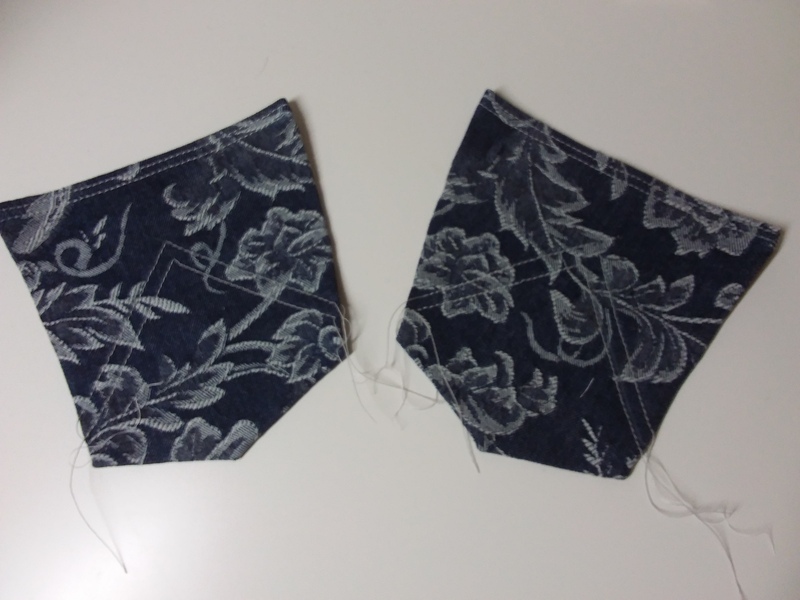 If I can make a coat, I can blooming well make jeans to fit me. I’m making them in the same size as before but, this time, there’s more stretch in the fabric so I should be able to bend my knees which I find comes in useful. Remember I asked for some advice as to whether the foxes on the fabric I was using for the baby quilt really had to be upright which meant messing with the layout of the the design? 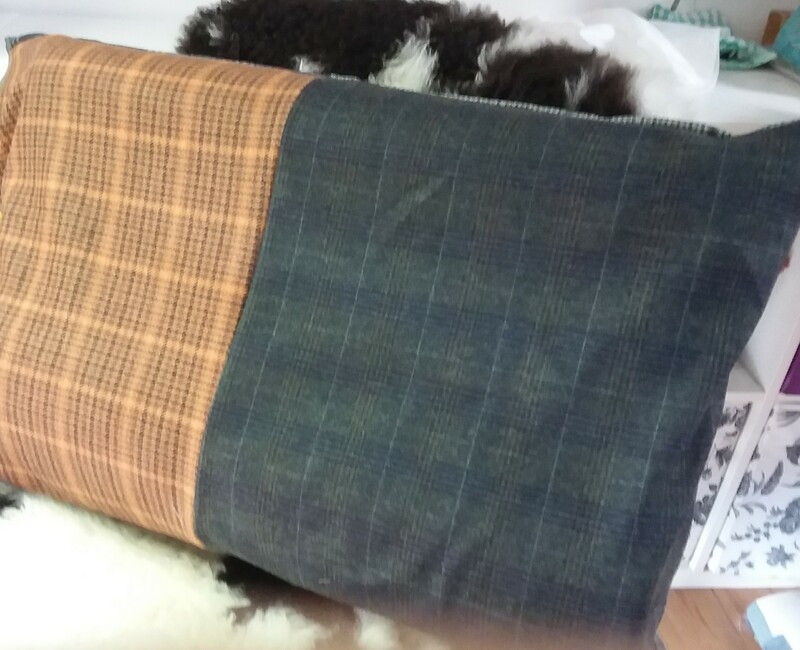 Well, those pesky foxes have been tamed, turned on their heads, or sides and sometimes even on their feet and have become a quilt for my great niece who is due to make an appearance in June. 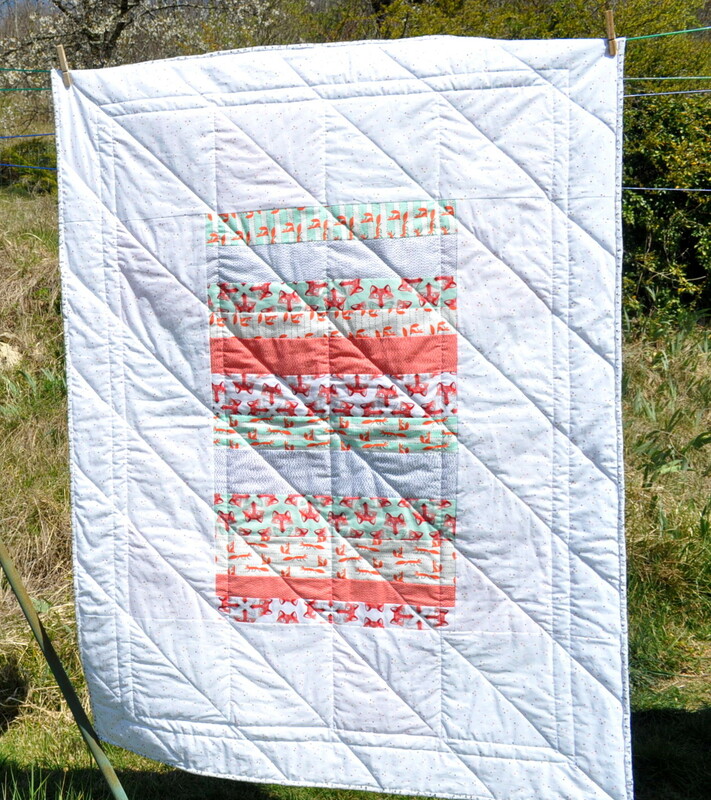 These ‘on the washing line’ photos aren’t the best but are to show you the quilt in its entirety. The sun is so bright again today they look a little bleached out and creased. Still, here goes. 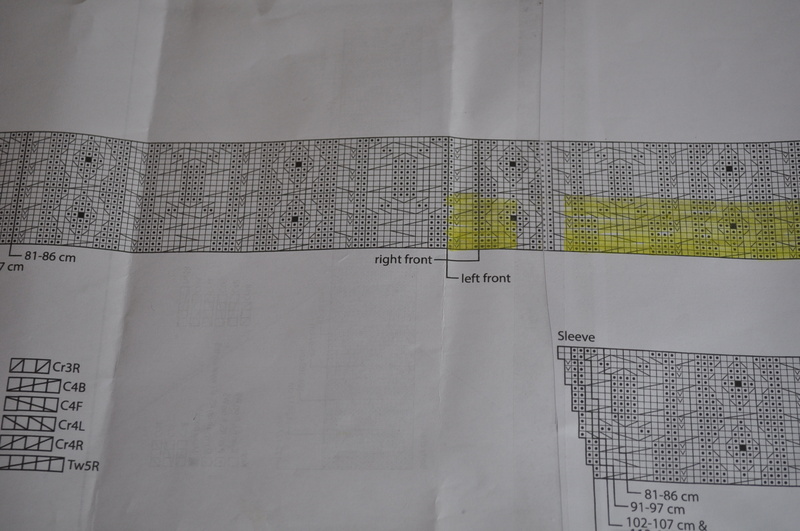 As you can see, I saw the sense in putting a narrow, plainer border between the centre design and the busy border. I also used the same fabric for the back around the centre panel I’d already made from the leftovers of the foxy range fabric. I was quite brave as, although it looks plain white, it does have tiny spots on it. 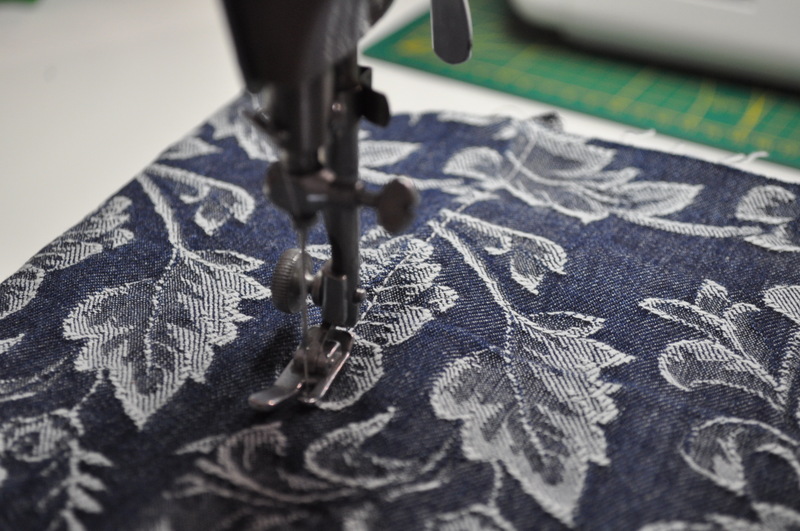 Brave because I usually try to hide my quilting – be it by hand (rare) or machine – as much as possible and the plainer the fabric the more obvious any mistakes. I stitched in the ditch and round the borders because I felt it went well with the geometric design and, I cannot tell a lie, because it’s easier. Here you can just about make out those little spots – even more easily if you double click on it. I had to put the parasol up in order to get these outdoor sofa photos otherwise there were shadows, bleached bits and all sorts. This time last year it was almost constantly raining so I’m not complaining. If you zoom in you can see that those orange and ‘grey’ triangles are not solid colours but orange with white dashes and white with black dashes. 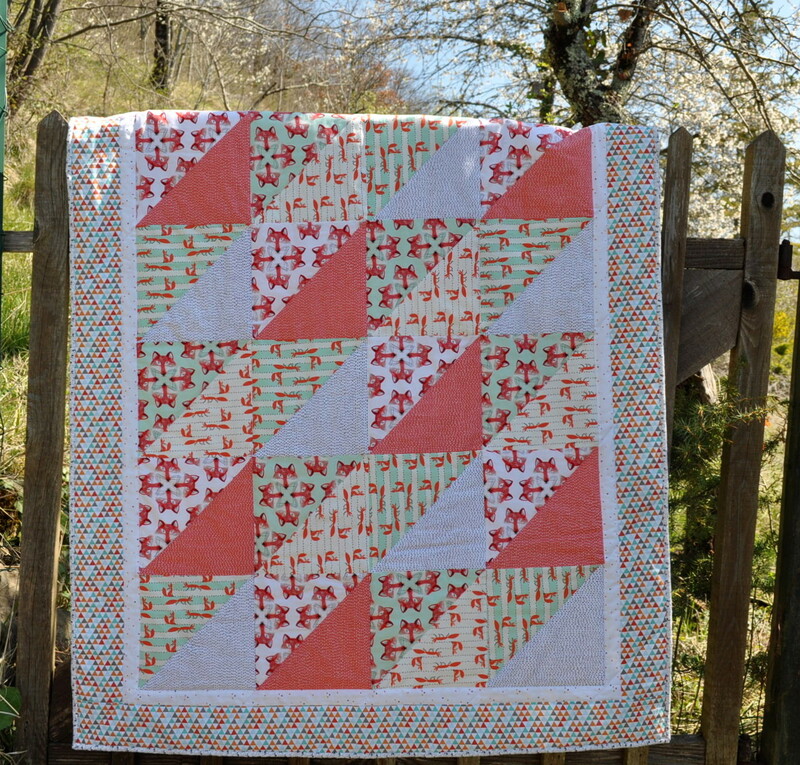 I definitely think the foxes are fine dancing around the quilt and not forced to be upright. The only thing I’d change would be the colour of the binding as I would have liked to do it in the same orange as the triangles but they are a sort of burnt orange colour and I didn’t have anything in my stash that fit the bill, whereas the white with black flowers was to hand and I am trying to use fabric I already have as much as I possibly can. I had to miss out the top row in this last photo but it looked lovely draped over the garden gate and the light was just right in this corner of the garden. 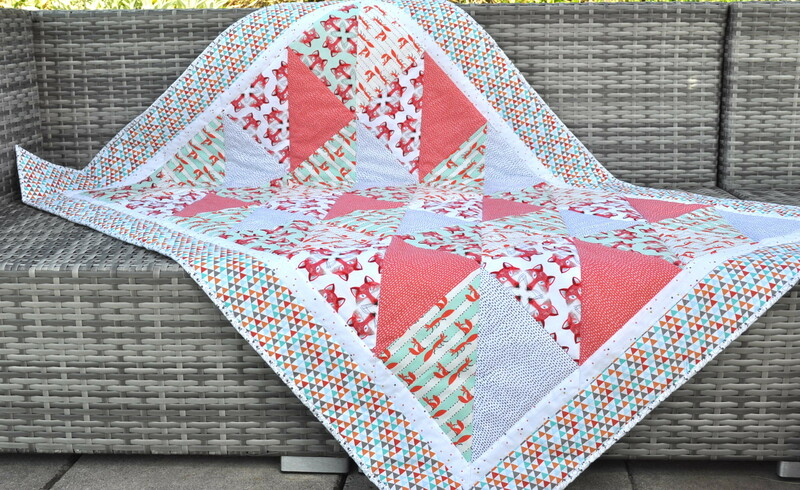 I won’t be sending the quilt until the baby is born because I want to put her name and date of birth on the quilt label but, never fear, I have displayed it in the sure and certain knowledge that my niece never has and never will look at my blog. If you’re at all interested, the pattern I used was a free one I found here. And I said I’d never make one. It’s lined and everything. I’m as chuffed as a chuffed thing can get. Can you tell? 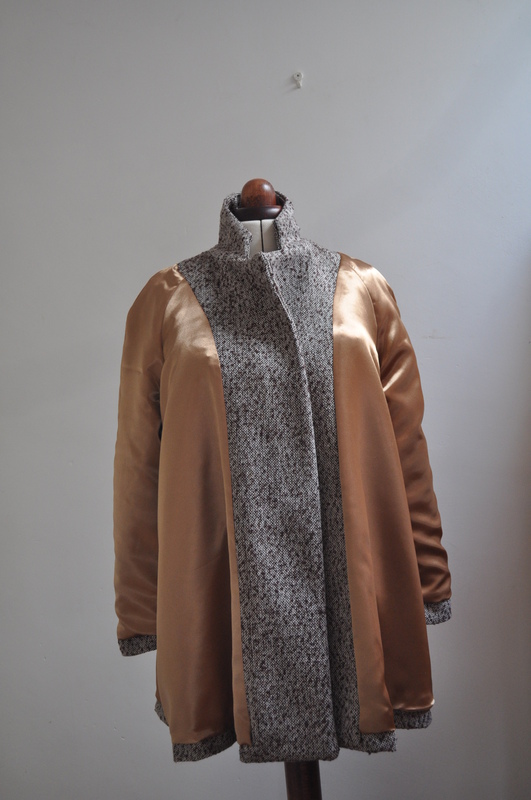 It’s the Opium Coat from Deer and Doe and it’s a swing coat which is quite fun. There is a belted version but thick, coating fabric belted round the middle is a look that concerns me. I know it would appeal to some people but, not being 5’10” tall and straight up and down, I’m not one of them. 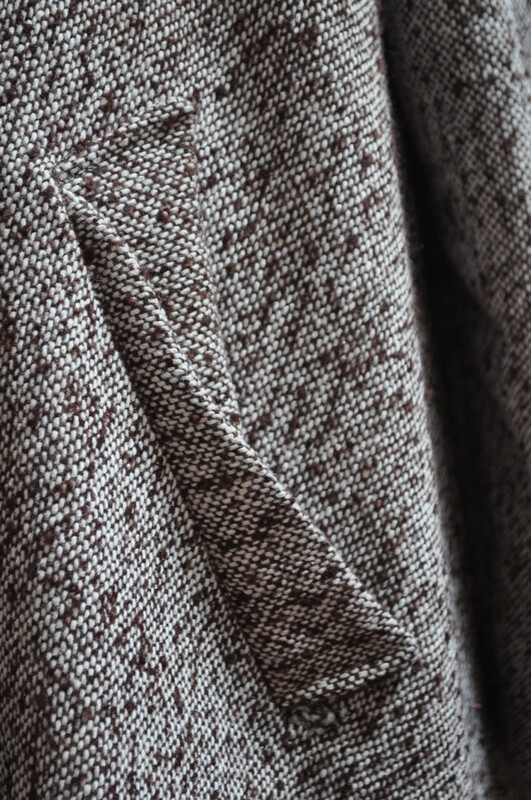 A special feature of this coat is the welt pockets, which Deer and Doe have called ‘origami’ pockets. (Other people may also call them this but, if so, I am unaware. They were a little bit tricksy but, although the written pattern instructions are good, there is some excellent help available on Deer and Doe’s blog for these pockets, the collar and the lining, which I was very grateful for. I think these unusual welts were worth the little bit of extra effort – more interesting than just the usual plain band. I managed to get over my fear of linings or ‘fódraphobia’ as Kate pretended it was called. On a real person – i.e. me – it has plenty of twirl potential. Please forgive parasol action in the background. Mlle. T. the Younger was taking the photos and didn’t think to mention it. 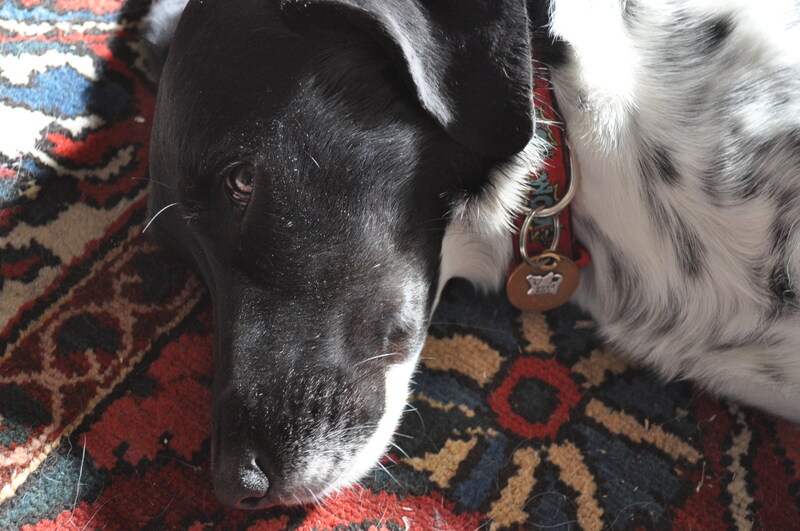 If I look a bit smug – it’s because I am. Just a bit. What will be next on my ‘never say never’ list? I do have to make another pair of jeans because, as you know, making them and actually getting into them are two separate things. If only I could bend my knees. But, never fear, I will not let them beat me and let’s end on a high note as I head off into a cordyline australis the sunset with my faithful companions. 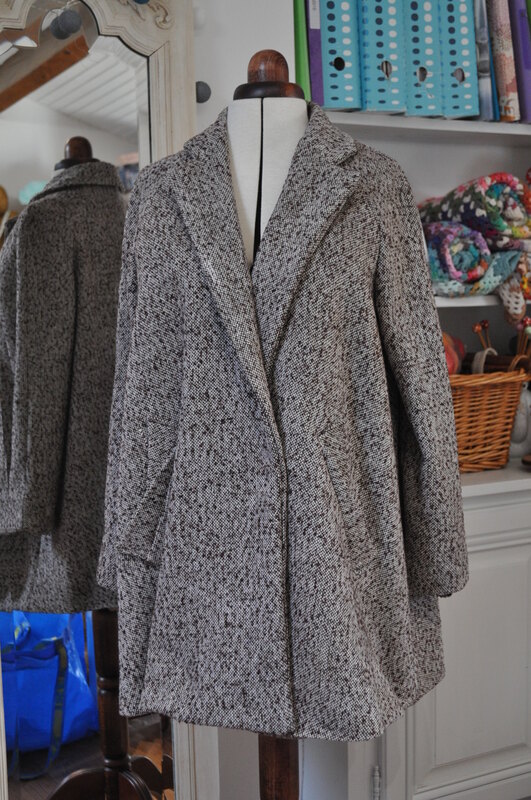 Have you ever made a coat or thought about making one? How did it go for you? Another post in my series where I don’t say much at all – or not as much as usual anyway. and then gave it to my daughter. I worked out if I bought just another 4 balls and substituted a couple of the colours with some from my stash I could make another one for me. This is because the knitted cardigan I’m making is too complicated to do in front of the telly but there are only so many crochet dishcloths one person needs and the ‘devil makes work for idle hands’ or, in my version ‘idle hands make me fall asleep’. 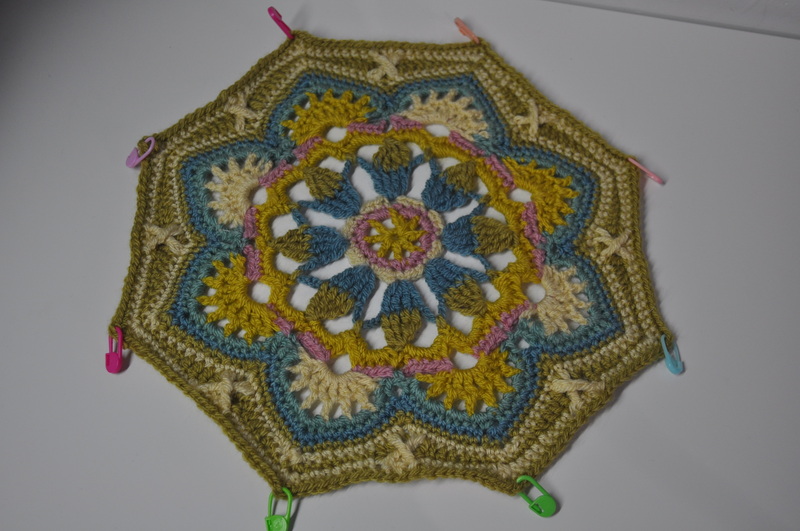 I’m making slow progress but am hoping to speed up as I get used to the pattern. Would it be cheating if I did the back in stocking stitch? Please say ‘no’. Using scraps to make something new was all about the dogs again this month. Well, apart from these cotton dishcloths I have been making as a ‘must do something useful while I’m binge watching a Netflix box set’ in the evening (which is ‘Dirty John’ at the moment by the way). Recognise the colours? It’s the leftover cotton yarn from the niece’s baby blanket. 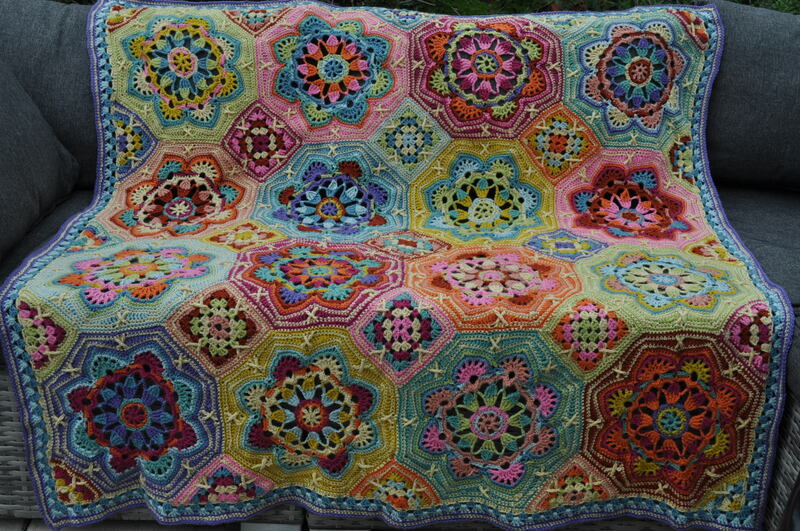 I’m actually going to start a new Eastern Jewels blanket – and keep it myself this time – because I had almost enough yarn left over from the first one to make another. I just needed another four 100g balls and am waiting for those to arrive. 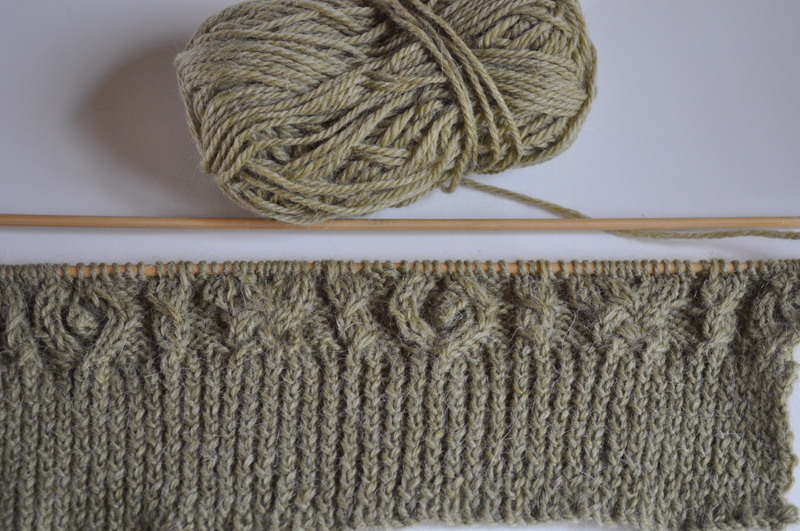 The cable cardigan I’ve started is far too complex to do without staring at it fixedly so these fit the bill. 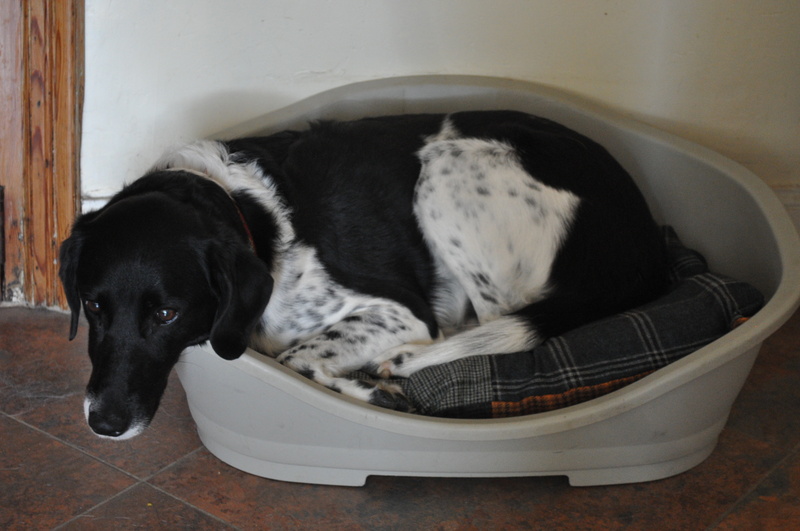 But, I digress – back to the dogs. 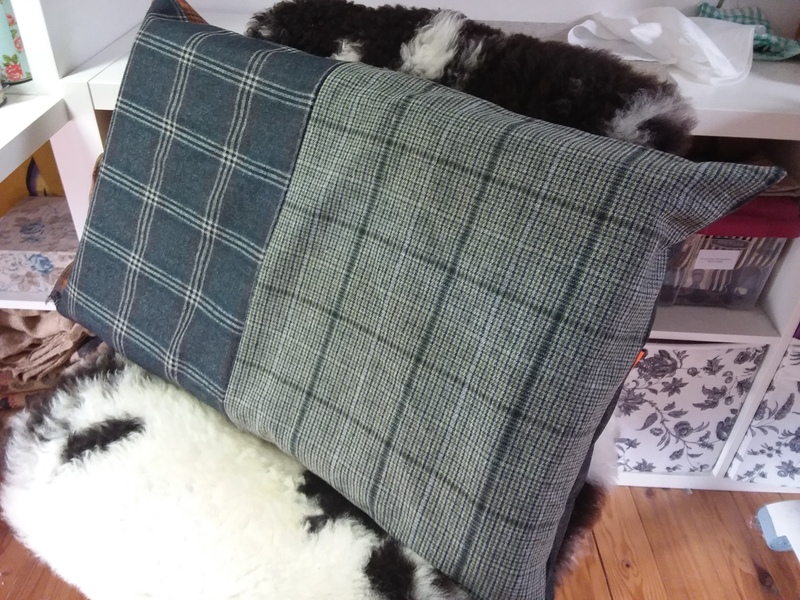 Remember those fabric samples for car seats I showed you before ? 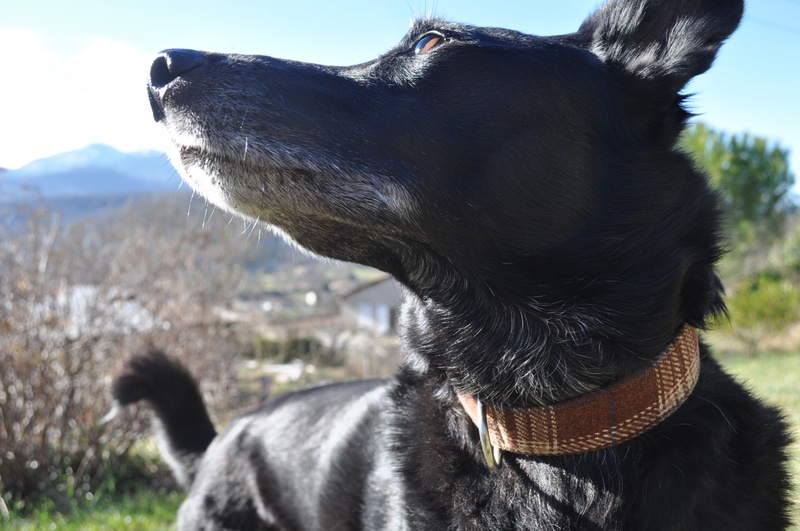 I made a dog collar for Stan with some of it on Scraphappy day in January. 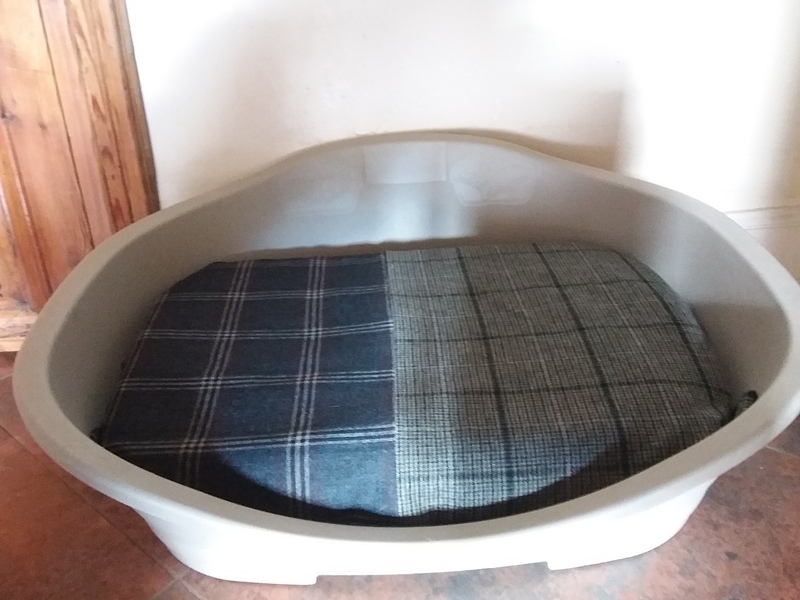 I decided to have another look at the samples for March’s Scraphappy day and, bearing in mind the state of Flo’s blanket which she regularly pulls out of her bed and then uses it to tempt Stan into a game of tug of war, I thought it might be time for something new. 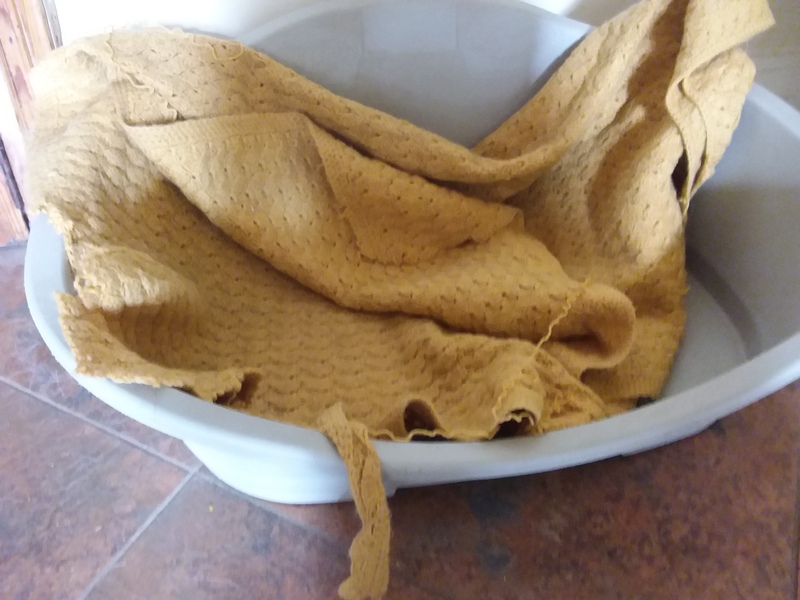 I feel quite guilty about that blanket as somebody had put a lot of work into making it but, if I tell you I rescued it from a charity shop initially, then used it as a throw over the back of a chair before demoting it to dog bed status, I hope you’ll forgive me. It has certainly had a life. Anyway, with ScrapHappy day approaching, I got a few of the samples out again and took them off their hanging cards. I decided to use an orthopedic pillow for the insert as I bought it for when I had a neck ache and it made it worse. 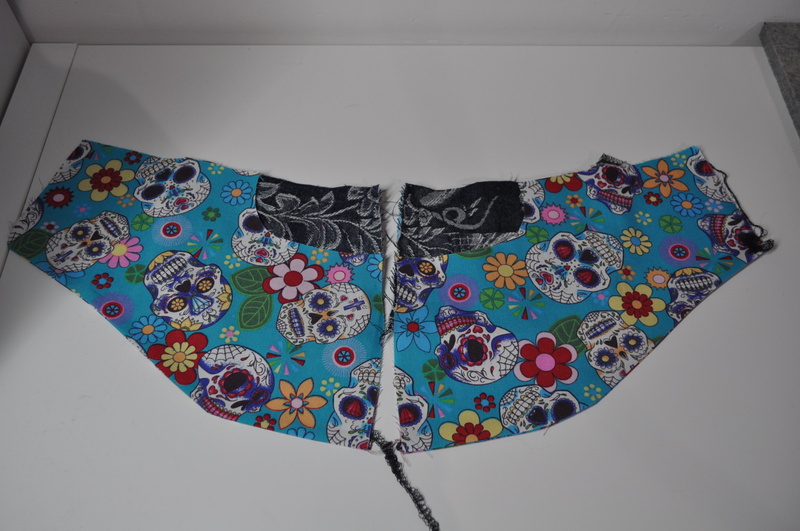 I joined a couple of pieces together for both back and front and closed one end – a bit haphazardly – with a snap closure. I might as well have sewed it right up I suppose as the fabric pieces claim not to be washable but we’ll see about that. and here’s the other side which is smarter in my opinion so will be placed facing up in the bed. At first Flo studiously ignored it. I expect she was upset that her old blankie had gone and was busy thinking of ways to destroy the new one. Then she came round to the idea. I must say, this monthly ScrapHappy challenge is good for me because, in an effort to join in, I usually come up with something useful that I probably wouldn’t have bothered with in the normal course of events. Plus, my scrap bin gets smaller. Joining in again this month with Kate & Gun’s monthly Scraphappy Day where you too can use your scraps of fabric, yarn, paper, wood, anything to make something useful or lovely or both and show it off to the world. You don’t have to join in every month, only when you have something to show. Details and a list of other participants’ scrappy endeavours over on Kate’s blog. In the mildest winter I think I’ve ever known since living in S.W. 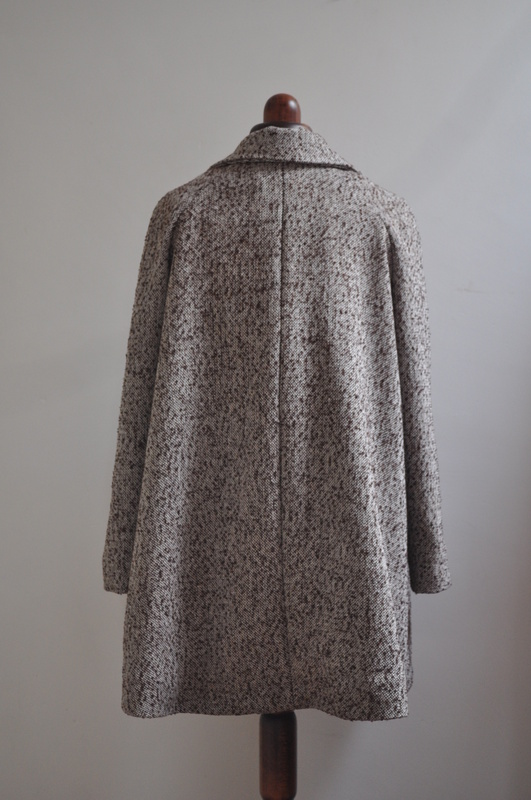 France, I decided to make a coat for the first time ever. Typical. The hem isn’t wonky it’s just pinned up for the moment waiting for me to attach the lining. 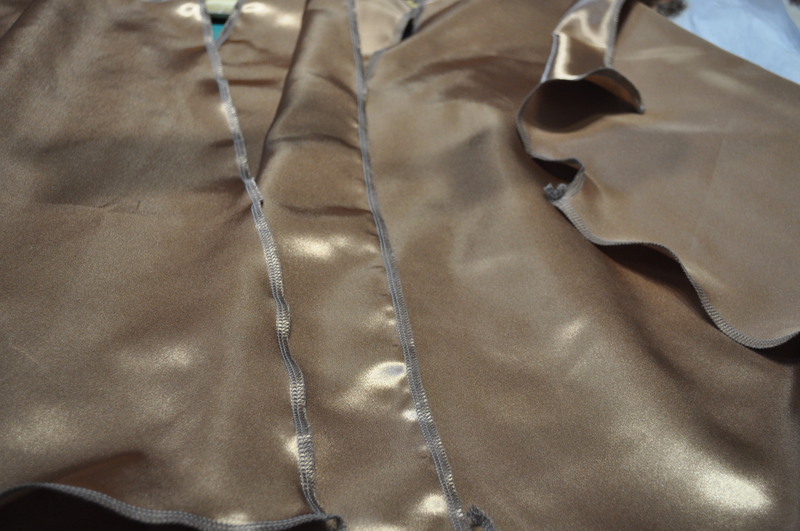 All overlocked/serged ready to be sewn together and inserted on my sewing afternoon with my friend tomorrow. Is there a word for being scared of lining? Continuing on with my baby makes, the main part of the quilt top is finished. 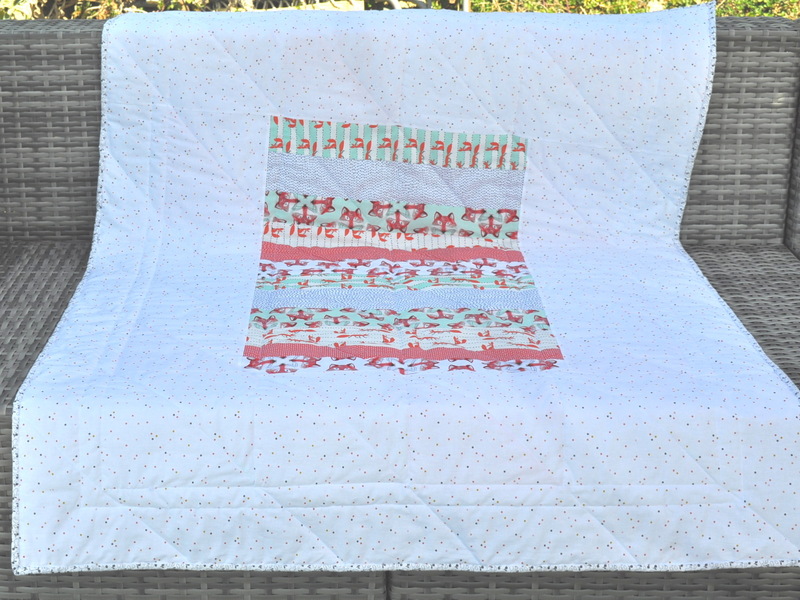 It’s hanging on my flannelette sheet design wall and, as you can see, I decided to stick with the original pattern design for this baby quilt and cast to the wind my concerns about upside down and sideways foxes. Any way up, this quilt will have some foxes standing on their feet and new mothers have more to worry about than making sure a quilt is always laid down in the right direction – laying the baby down in the right direction was enough to exercise my exhausted brain if I remember correctly. I’ve tried to brighten up the photos a bit this time so hopefully you can now see those triangles are not grey but white with black dashes on. Although grey continues to be ‘on trend’ so I suppose it wouldn’t matter if they were. 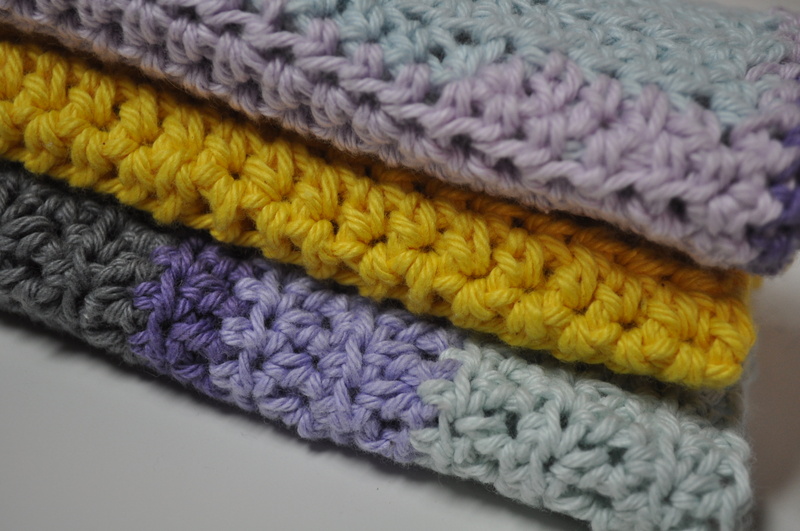 It will have a 4.5 inch border and I happened to come across these two cottons which are very good matches for the other colours. 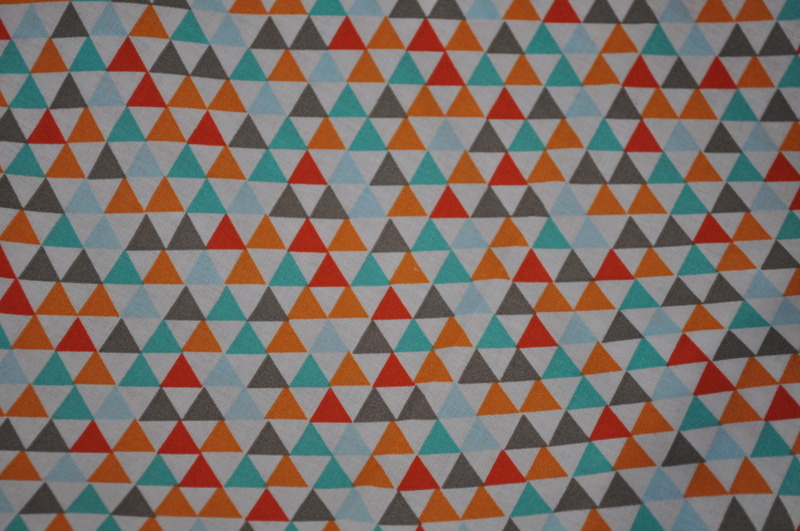 and some bright little triangles. I made a panel of left over strips of the foxy fabric range which I thought I’d put in the centre of whatever I use for the backing and I’ve been laying out the possible options on my bed. At the moment I’m veering towards the small triangles for the front (right of photo) and the spotted white to form a frame around the strippy panel on the back. 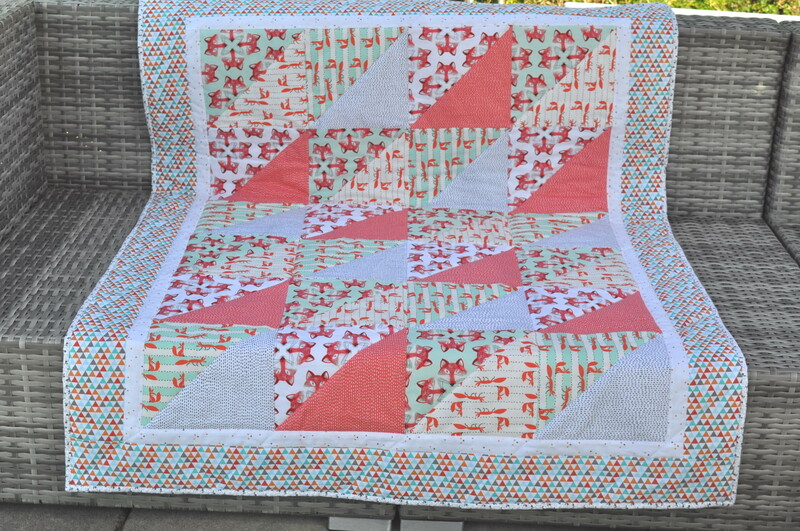 I’m just wondering whether to frame the quilt top with a narrower border of white confetti spots before adding the small triangles or letting them run riot right up against those wayward foxes as shown. I’ll probably be doing this sometime today so I’ll show you what I decided next week. Unless you have any thoughts of course. 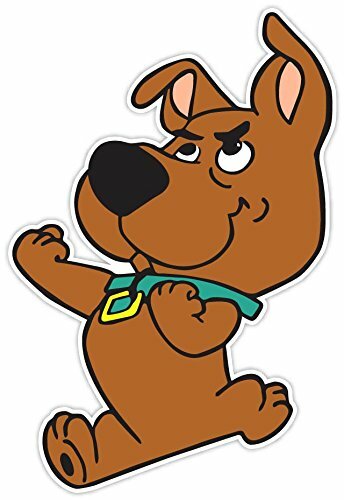 You are currently browsing the archives for the Arts and Crafts category.